If you are looking for a Sunday Roast in Islington – The Hops and Glory serves a great one! You would never really notice this pub or know it exists as it is quite hidden away from the busy streets. It has a cosy, rustic vibe and they have their own craft beer brewery as well as their Gastropub. We went on a late Sunday afternoon last December for a tummy warming Roast Dinner. We shared a couple plates of sourdough bread soaked in beef dripping and gravy while we decided on what we wanted for our mains. It was actually full of flavour and a great start to the meal. For my main I went for the pork (I will usually go for the lamb or pork when I am out for a roast) which came with some gorgeous roasted veg and some apple sauce. I did add some more gravy as well! I have had some bland roasts before and this was NOT one of them – It was all full of great natural flavours. For dessert we all shared the rice pudding and a cheese board as we were very full but wanted a little something to end the meal. Great English food, lovely pub, and fab service. I am coming back this winter for more roast dinners! Frank’s Canteen in Highbury has such a lovely neighbourhood vibe to it. You walk into a buzzing restaurant with tables filled with young families and groups of friends all chatting away excitedly with one another. It is such a great vibe in there! Sandra had a kedgeree, which I had never seen or tried before. It was really nice and rich in flavours and I found out that this is a very classic British breakfast dish that comes from the British colonial days. Jack and I had poached eggs on sourdough – Jack’s with a side of bacon and mine with a side of smoked salmon. The eggs were done properly and were drizzled with a gorgeous basil/pesto-type oil. A lovely neighbourhood brunch spot! It might look like a take out kebab shop as you pass from the outside, but as you walk in you will see all the fresh meat skewers and the long hot coal grill with its smokey, mouthwatering and incredibly inviting smell drawing you in. At the back there is a large restaurant seating area. Mangal Ocakbasi is a Turkish grill house based in Dalston that Jack, his mum Sandra and I discovered one evening. We ordered a plate of mixed dips to share as a starter – which came with a basket full of warm Turkish bread. For our main we ordered a large mixed grill plate to share which came with a large plate of salad. The spices on the meat enhance the flavour and are not overbearing and there is a barbeque like taste to it. We were actually surprised at how delicious it all tasted. We ended the meal with some sweet baklava and a Turkish tea – which was nice to have a little bite of sweetness after all the spiced meats. Gorgeous, well priced and a buzzing atmosphere! Getting a table at Dotori in Finsbury Park is like seeing a unicorn. Okay – maybe more like seeing a shooting star. No one ever picks up the phone, you cannot just rock up because its always booked up, and when you go there you need to go during their opening hours and book at least 1 week in advance. You hear stories about people going Dotori and having such a good time and it sounds like its a fairy tale or a myth! Well, my turn has come to tell my tale of the time I finally got a table at Dotori. Emma and I went for our housemate Christmas Meal at the end of last year. and we got ourselves a feast of glorious Japanese/Korean goodness. The Salmon Temaki (£3.80 each) is a salmon and roe hand roll which was a refreshing start to the meal – the seafood is so fresh I would definitely recommend some sushi/sashimi/temaki with your meal. The Tofu Jeon (£4.50) was a bit more bland than I thought it would be so I wouldn’t recommend. Samgyeopsal (£7) is a Korean style BBQ pork which comes with lettuce leaves that you use to wrap around the pork (like a fajita, ish) and that was gorgeously flavoured and came served on a sizzling hot plate. The Ebi Tempura (£7.50) is a prawn tempura dish which was crisp and authentic. And finally the Haemul Pageon (£7) a seafood pancake which is a favourite of mine and it comes on a massive dish so its perfect for sharing. If you have the opportunity to visit the legend that is Dotori – You must! It is a tiny little place, always super packed but the service and food are fabulous! In Highbury, nestled in the suburban townhouses, the is a very small cafe called Finks Salt and Sweet that I would absolutely recommend. In the summer there are little tables outside so you can sit out in the sunshine. They do a great cup of coffee and they have a simple fresh menu and are so well priced. I ordered the avocado, rose harissa and goats cheese on sour dough toast £5 and I asked for some smoked salmon £1.50 to go on top. I was surprised how well the harissa went with the avocado and added an element of Mediterranean spice to it but still had a freshness to it. It definitely kept me full for ages and tasted amazing! And you look perfect on a plate. You are absolutely wonderful to me. So, this particular Saturday, the brunch crew consisted of Myself, Fiona and Maria. We decided on T and Shop in Cannonbury. It is a gorgeous little cafe which is also a shop that sells beautiful handmade home ware, jewelry, and great gift ideas. 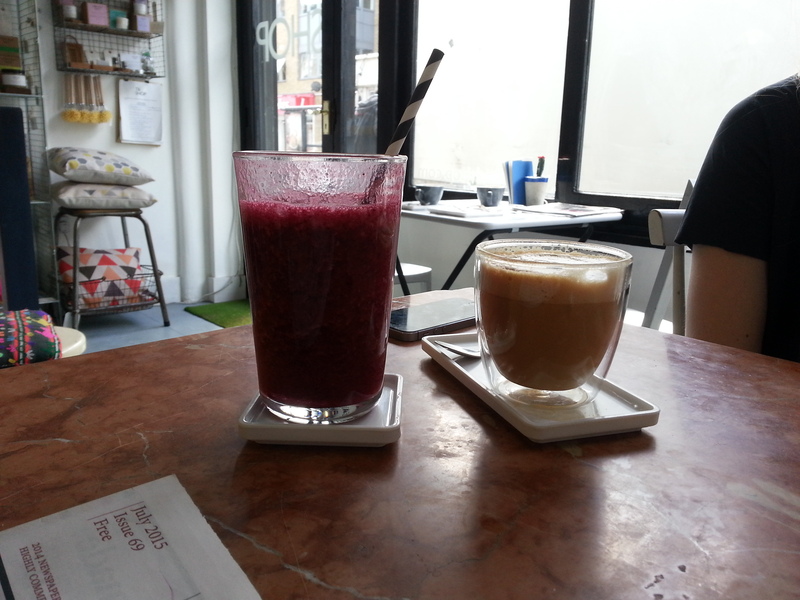 The coffee was delicious and so are the smoothies so even if you are in the area and need a coffee break, I would definitely recommend popping in. 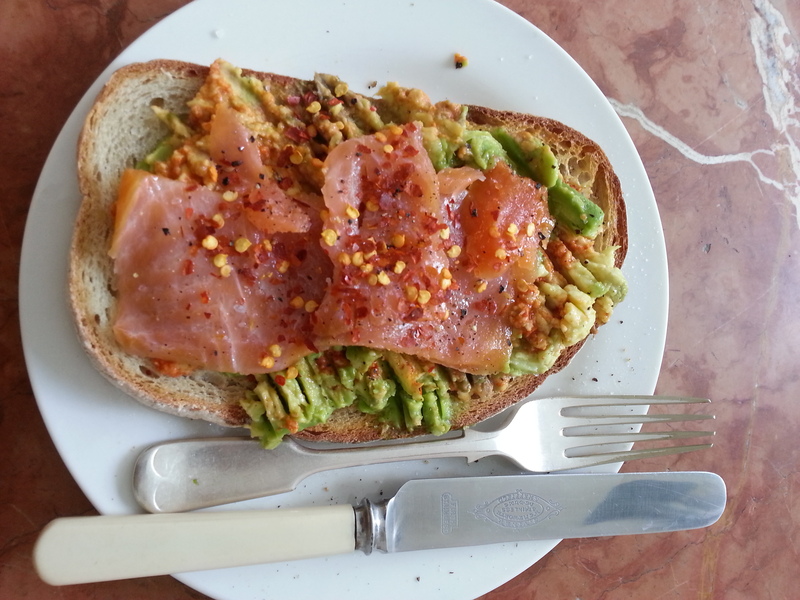 Fiona and I both go the mushed avocado on sourdough toast with smoked salmon sprinkled with chili flakes. It wasn’t anything fancy but it was just what I needed and it tasted so light and fresh and it really was the perfect amount. It was well priced and good food. Afterwards we had a look around the shop. Loads of interesting and wonderful things. 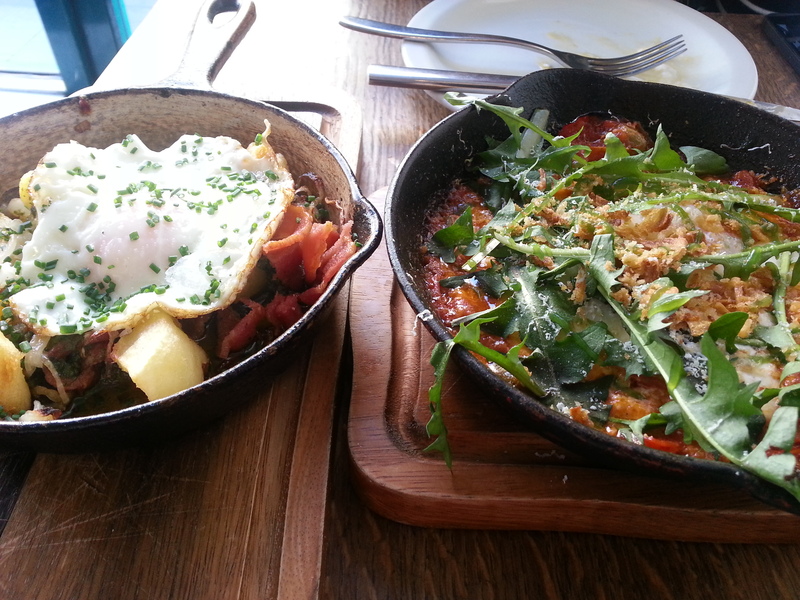 I have been to White Rabbit in Dalston a couple of times for brunch now for their ever changing brunch tapas menu. Pros are that there are always new dishes to try, however the cons are that you can go back for something you loved and it could be gone. I went the first time with Fiona. We sat by the window as I admired the quirky Scandinavian interior with it’s bright, clean cut feel. We got the menu and saw that it is £30 for 5 brunch dishes, we decided to get all 5 to share between us- although as the dishes came out, we quickly realised that these could actually be shared between 3 people. We started our White Rabbit brunch tapas experience with a plate of blood orange, ricotta and Cashew Nuts, which was a delightfully refreshing, light start to the meal. The orange worked surprisingly well with the creaminess of the cheese. 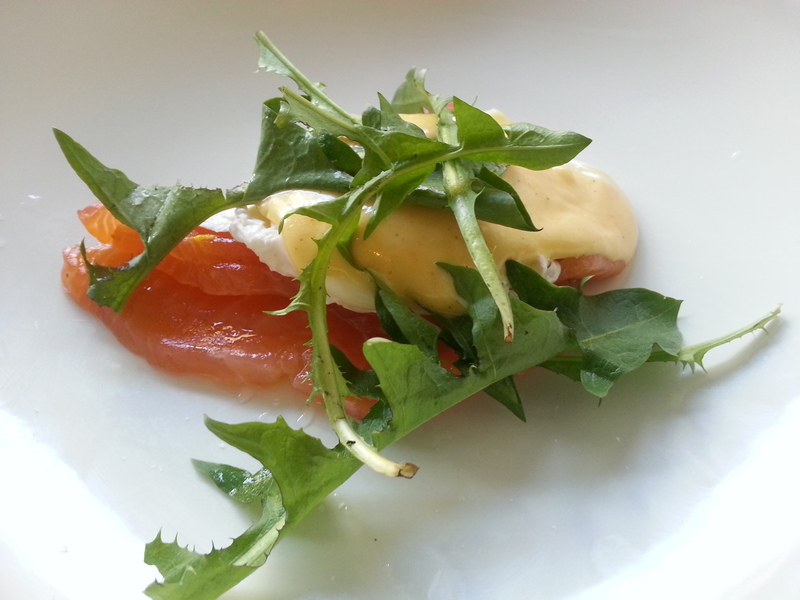 Next came the cured salmon slices with a poached egg and hollandaise sauce to cover the egg with arugula sprinkled over it all. The salmon was light and not too fishy or salty and the yolk from the egg oozed over it all as we cut into it. Then came the heavier plates. The Green Eggs were a saucepan of potatoes, bacon and a fried egg covered in chives, which was probably the most ordinary of all the dishes we ordered but still tasted great. The baked eggs in a pan of tomatoes, chilli, bell peppers and cheese with arugula spinkled over was bursting with all sorts of flavours and had a gorgeous hint of warm spice from the chilli. The cheese was springy as you forked into the mixture. Altogether a great combo. The burrata was a creamy ball of mozzarella-like cheese which you should not cook and should eat fresh. We tore the balls apart with our forks and even though it felt light, it was definitely very filling. A great way to end the meal. 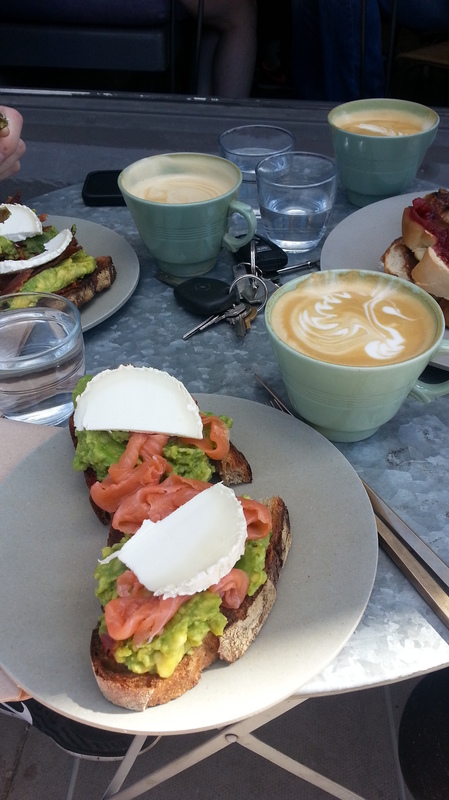 One of my favourite brunch spots – definitely worth a try!